Ubisoft’s tactical shooter is taking operations to the next level in the coming weeks with the launch of the all-new Operation Para Bellum. Rainbow Six Siege is already one of the most complex tactical shooters on the market but this new expansion adds even more mechanics to the mix. 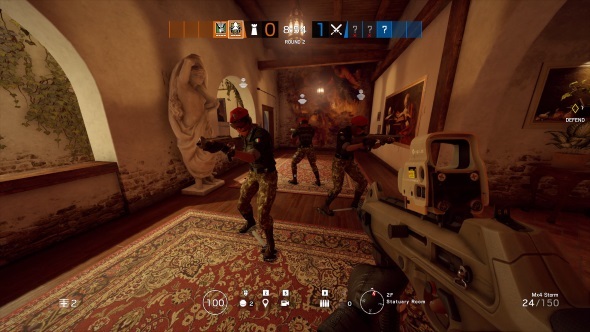 The new updates have already hit the TTS and so pros are already devising devious strategies to take full advantage of the new operators. The combination of the Villa map’s verticality and the malleable new gadgets and abilities that come with the new operators create a wealth of opportunities for outsmarting your opponents. With the inclusion of decoys, camera-turrets, and new weaponry, there is plenty to learn before you start dominating the new Italian operation. Looking for more tactical co-op action? Check out our run-down of the best co-op games on PC. All of the changes can be overwhelming, especially to new or inexperienced ranked players, but armed with our tips and a keen eye, you too can be operating like a maestro. Here, we run down the essential tactics that will have you going toe-to-toe with the pros. Bellissimo! Visually, the new map Villa exudes the natural beauty of its Italian setting, but the action that takes place within is guaranteed to get ugly. The map will keep players of all types on their toes with an aggressive combination of close-quarters combat zones and long hallways that are sure to lead to some intense standoffs. Its soft and destructible walls provide ample opportunities for all-out assaults, at least for those who can make it past the foreboding basement that provides outside access to the villa. Given that the Villa belongs to a villainous mob boss (picture Fat Tony, but meaner), there are naturally some pretty tough defenses as well. There is an abundance of stone walls around the exterior that provide the perfect place to stack up and regroup. In the TTS, players have discovered something fascinating: there is one – and only one – reinforceable floor, above the objective point on the second floor. This is a spot of floor, not a hatch, that can be blocked with the metal reinforcements, preventing enemies from firing through the wooden floorboards. While this may be a bug that will be patched out soon, it’s worth building a strategy around shoring up your defenses here to give you an immediate advantage when defending – at least for now. Where Maestro really gets interesting is in his unique gadget, the Evil Eye. These bulletproof surveillance cameras can spot enemies through smoke and tag them for teammates to identify and dispatch. This slippery spyware also fires lasers that will gently sap your opponents’ health at five points per zap. While this gadget is bulletproof, bear in mind that it is vulnerable while the laser is firing. Much like Symmetra’s turrets in Overwatch, these pesky devices can be hidden in delightfully devilish locations, cooking enemies like a well-steamed ham. Expect to see Evil Eyes opening in doorways, windows, around, inside, or even above objectives. Perhaps the most interesting thing to note about the Evil Eyes is their range. As redditor xMictlan has discovered, these sneaky devices seem to have an unlimited range, which he tested from 100m+ distance. It’s also worth noting that the whole defending team can observe what the Evil Eye sees, meaning they’re a valuable addition to the CCTV network. 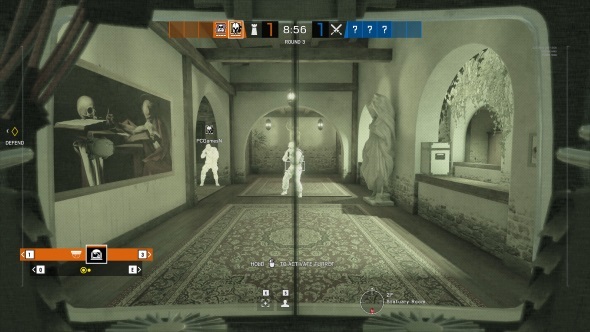 And with the arrival of the new bulletproof cameras in the equipment slot for some operators, defenders can now acquire a huge field of vision over the map when using a team that includes Maestro and Valkyrie. Alibi’s Prisma device can be placed around the map to create decoy holograms to sucker in unsuspecting opponents. To rub salt in the wound, any player that shoots at, or steps through, Alibi’s sneaky traps will have their location revealed to defenders. That location tag only sticks around for a few seconds, so don’t dawdle, get in those quick kills and split! One good tactic is to stand among Alibi’s myriad decoys, forcing the oncoming attacker to make a split-second decision with the odds in your favour. It’s a risky strat to be sure, but it’s one that gets the seal of approval from top player and streamer Zen. Oftentimes, the mere hesitation of an opposing player is enough to get the drop on them. Bear in mind that some operators can get the drop on Alibi’s decoys including Twitch, who can hunt down and destroy the decoys remotely, Thatcher, who can stall them, and Glaz, whose scope sees through the deception. 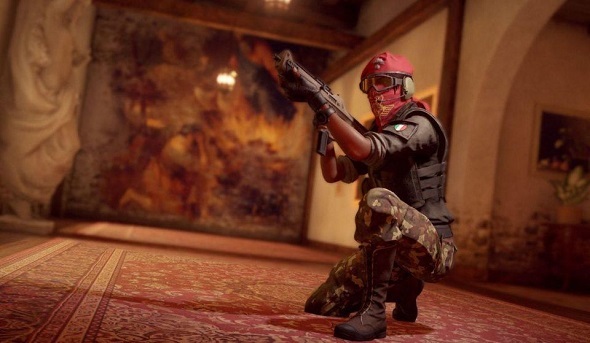 As some quick-witted players have discovered, Alibi can actually stand within her decoys, hiding herself within an obvious deception. Go for this tactic in doorways and windows and you can score yourself some easy knife kills to unsuspecting intruders. Attackers will do well to train their eyes to spot Alibi’s decoys as quickly as possible if they wish to survive in Para Bellum. Alibi’s decoys always come equipped with her trademark submachine gun. If you see Alibi wielding a custom gun then you’re looking at the real deal. The hologram is also slightly less detailed than the player model, with lower resolution textures, which can help you spot one if you’re close enough. Alibi’s focus is on speed and how she can easily zip around the map, scoring quick kills while her decoys slow the oncoming attackers. Spawn peeking with Maestro is technically possible, but as YouTuber Yo_Boy_Roy found, it’s a tricky move to pull off. Due to its weak damage per second, the turret is likely to be destroyed before it has a chance to do any real damage at long range. Combined with a smoke grenade, this is a useful item for repelling enemies who are planting. Because the Evil Eyes operate on a cooldown, there is no long-term limit to how much damage you can inflict with them. Place these cameras overlooking the enemies’ spawn points or entry location to soften them up before their attack, but beware that this will leave you vulnerable to being flanked.